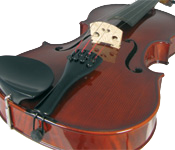 The violin top and back are carved out from solid wood. The top is spruce and the back, sides and neck are generally from maple. The bassbar is an integral and tonally important part of the top. The soundpost is fitted about 1/4" behind the treble foot of the bridge and connects the front and back of the instrument acoustically in a way that shapes the sound considerably. The most popular type of maple used in violins has a curl in the grain which shows up as a flame effect.